Macau is an autonomous region on the south coast of China very near to Hong Kong (an hour ferry boat ride). Macau is also a Portuguese territory until 1999. Visitors usually come here for its giant casinos on the Cotai Strip. If you have no interest in gambling but love photography then you may want to include Macau Fisherman’s Wharf into your itinerary. It has plenty of instagrammable spots in this theme park. This is the largest leisure and themed entertainment complex in Macau but you will be shocked at how little crowds at this 1333,000 square meter complex. It has a few hotels, a marina, dining and shopping, casinos and entertainment facilities. There is no entrance fee for this theme park, it is free. At the entrance of the Fisherman’s Wharf, there is an outdoor replica of Colosseum equipped with 2,000 seats, designed as a venue for concerts and other performances. There is a fence blocking visitors from entering the amphitheater so you are only allowed to shoot pictures behind the fences. I have not been to Italy yet so visiting the replica of Colosseum wasn’t a bad idea. I tried to find if there are any fun rides but I could not find any, except this little train but it is not in operation. Do not expect any rides for younger children, I think most are closed down. The red vehicle is not running but only for pictures. You are allowed to sit at the back seat, not the front seat and take pictures. There aren’t any rides for the kids but found a classic car ride for VIP guests. Is it Worth to Visit? Why not? It is free of charge. Come in here and spend half an hour to an hour shooting your best Instagram post. The good thing is there are plenty of photogenic spots and with fewer crowds so fewer photobombs. 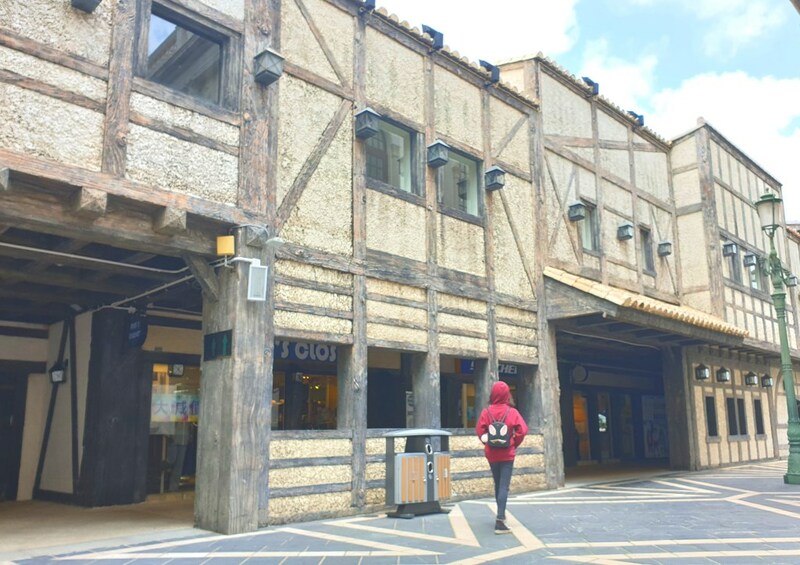 Macau Fisherman’s Wharf has over 70 stores and restaurants in building built in the style of different world seaports such as Cape Town & Amsterdam. There are many restaurants but most look quite vacant and without many guests. You can easily get a place without any queue. You can also find Thai, Indian, Japanese, Western food here but I think are quite pricey. Another interesting architecture, the Babylon Casino. Fisherman’s Wharf is very near Macau Maritime Terminal, if you are taking a ferry from Hong Kong then you may want to make a detour to visit Fisherman’s Wharf since it is free. One of the hotel in Fisherman’s Wharf, Rocks Hotel facing the sea. You need about an hour to explore this place, check out the sea view and also shoot nice pictures from the colorful buildings. If you like great photos for your Instagram account, then pay a visit to the Macau Fisherman’s Wharf. It has plenty of nice instagrammable spots. The crowds are less as compared to other attractions in Macau. Not sure why there aren’t many visitors, I guess people are all at the gambling tables at the casinos. Please do not have very high expectation when visiting this place. Like I say, it is cool if you love photos shooting. oh wow! this for sure looks worthy enough to visit! I love all the architecture! The architectures here are stunning for photography and less crowd. Highly recommend for anyone who likes pictures for their IG. Nice retro place. This place makes me feel like the 50’s of Hollywood. Very hard to find places like this in this world. Must check it out when I go the Macau next, Super Thx! Haha, Macau Fisherman’s Wharf adopts the Rome & Greek Theme so you certainly feel old vibes here. That stinks that the rides are closed down but, MAN, the architecture is beautiful!!!! I guess the crowds are just too little to support their daily activities. Visitors who visit Macau usually stay in the casino tables and bet for all days. LOL. The architecture is insane! Looks like your walking through history. Love it. I really love the little stroll in Macau Fisherman’s Wharf as this place has few tourists and yes very nice architecture as backdrops for the pictures. I’ve never been to Maco before, I would love to go visit one day for sure. Thanks a lot for sharing. People usually visit Hongkong and pay a day trip Macau. From Hong Kong to Macau by ferry, it take about an hour. The Roman Ampitheatre is beautiful. This looks like an incredible place to visit! Macau Fisherman’s Wharf has few themes and the Roman Ampitheatre is one of the nicest one for photo shooting. I am obsessed with the architecture. It is so cool looking!! Thanks for your comment. Some buildings are painted with bright colors which make a great backdrops. I can’t believe that such an incredibly beautiful place exists in Macau, so much so that it looks like something out of a movie! I agree with you, it is beautiful but under utilize. Tourists aren’t coming here but most would rather visit the Venetian at Cotai Strip, another tourists spots in Macau. Macau is an interesting small country situated near Hong Kong. It was colonized by the Portuguese but returned to China in 1999 so you see a blend of west and east in this country. Road signs all are written in Chinese and Portuguese. Awesome photography. I hope to visit Macau soon. When you visit Hong Kong, you can also include Macau as it is super near, an hour by ferry from Hong Kong ferry terminal. OMG the details on the building are incredible! I would love to go there one day. Looks like an interesting place to visit! A lot to soak in, indeed! Looks like a lot of fun! We have a fisherman’s wharf close by in San Francisco; I’ll have to visit soon! Yes, I have been to Fisherman’s Wharf at San Francisco, I love the seals there so adorable but the parking near the SF Fisherman’s Wharf are so expensive! Too bad, I did not make it to Alcatraz prison to have a peep at the life in prison in the states. This definitely looks like a fun place to visit for free. The Babylon casino has such interesting architecture. One thing I like the most is there is no entrance fees! Anyone who is coming from the ferry terminal, can just walk over to the fisherman’s wharf and take a look since it is free. I agree Babylon casino is beautiful, like the bling bling vibe. the place looks lovely and nice to visit. I am so sure it is worthy! Since it is free so there is no harm to pay a little visit and snap some pictures. Things here are a little expensive so you may want to avoid having meals here. The place look stunning for photos but there aren’t many crowds as compared to other tourist spot in Macau. Other places such as Venetian in Cotai Strip and St Paul Ruins are super crowded with tourists. If you love peaceful time and have more time to spend in Macau, then pay a little visit here and snap few pictures. There is no fees to enter this place. If you love gamble then you can stay all day here, else a good 30 mins to an hour is good enough as most of the shops are closed and no rides. Does look like a great spot for some IG shots! love all the culture. This is a great place for IG shots, other than that, nothing much. This looks so fabulous and massive too. Surely a great place to indulge in selfies and while admiring the architecture. You are right, people who love photography should visit this place. I saw a professional photographer was shooting for the toddler as there are plenty of photo opportunies with good backdrops. I love the colours and the architecture! However it looks kind of deserted. This is so awesome that their admission is free! Not too many places do this at all anymore. Looks like it would be so fun too! Like you said, it is strange there are so few people in a themed park and that there are no rides for kids. However your pictures are amazing!